This little cutie will grow to be silver! Wow! What a week we have had! I can honestly say a week and one day ago I truly did not have any idea I would have 7 itty bitty (or not so itty bitty now lol) standard goldendoodle pups in my dining room, but here we are! I can't tell you just how much I adore these squirmy little babes. They have grown SO much! Mom is doing great. She eats, A LOT. I've been making sure her food and water bowls stay full at all times, and I am sprinkling puppy replacement formular powder on her food for added calcium and nutrients. This has definitely been a learning adventure for us this week! 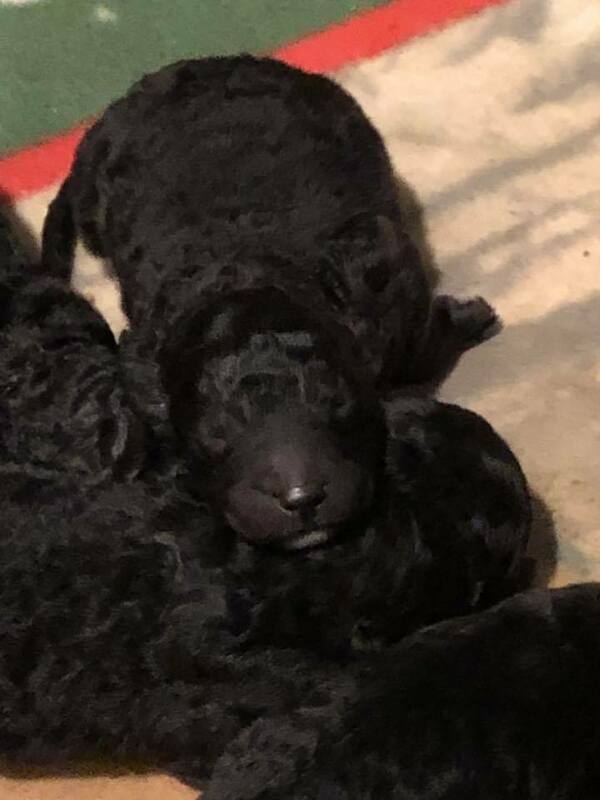 Puppies are going to range in price from $1000 for solid black to $2500 for silver, so if you would like one please hop over to my facebook page and send me a message!